The world has long been obsessed with finding extraterrestrial life. Sadly, most of the planets that we stumble across seem rather uninhabitable. Indeed, the number of worlds that we see as being “habitable” is rather low. This makes recent findings about the Earth’s habitability rather surprising, and it seems that the universe may be more welcoming that we think. According to a study, which is based on a new calculation that rates exoplanet habitability, our planet (the one that we live and breathe on) scores just 82 percent on the habitability index. You see, despite the fact we are a hundred percent sure that this planet has living inhabitants, the habitability index places us a little too close to the Sun. This new calculation was developed as a way to help scientists in their search for alien life on other planets. The index was created last year based on habitability-influencing factors, such as atmospheric pressure, access to water, geology, and how much energy the world in question can absorb (or reflect) from its nearest star. All things considered, researchers have come to the conclusion that anyone looking at Earth for possible signs of life would assume our proximity to the Sun means our planet could very well be too warm to be habitable. As a result, they may focus their attention on other nearby planets that score higher on the habitability index. Of course, we must also remember that alien life might have evolved on worlds that are far, far warmer than our own. As such, their “habitability index” would look very little like our own. Their findings will be published in The Astrophysical Journal. 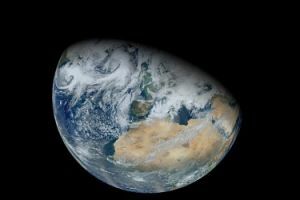 Move over Asteroids, Earth’s Water May Have Come from…Dust?